There’s a chill in the air, the holidays are almost over, and 2010 will be here before we know it. TheGameReviews is ringing in the New Year with a bang! Every day, for the next week, we’re giving out some great prizes – a total of over $400 worth. Games, accessories, prize packs – you never know what we might be giving away! 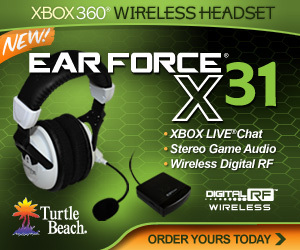 First up: an x31 gaming headset for the Xbox 360, courtesy of Turtle Beach. This wireless headset will pump the sound from your games directly to your ears, preventing background noise, allowing for a much more immersive experience. How do you win this fantastic prize? It’s simple: find the hidden snowflake somewhere on our site. When you do, email Chris.Poirier@TheGameReviews.com the URL where you found it. All correct answers will be entered to win! The secret snowflakes will be well hidden – check our forums each day for clues as to their location. * Entries for today’s giveaway will be accepted until midnight EST on Sunday, December 27.